"Adventure of a Lifetime" is a song by British rock band Coldplay. It was released on 6 November 2015 as the lead single from their seventh studio album, A Head Full of Dreams (2015). "Adventure of a Lifetime" reached number seven on the UK Singles Chart and number 13 on the Billboard Hot 100. It also reached the top 20 in a number of countries, including Australia, Austria, Canada, Czech Republic, France, Germany, Ireland, Italy, the Netherlands, New Zealand, and Switzerland. The official music video was directed by the band's long-time collaborator, Mat Whitecross. It was released on 27 November 2015. The concept for the video was hatched after Coldplay frontman Chris Martin and British motion capture expert/actor Andy Serkis met on a plane and discussed ideas. It took about six months in the making of the music video. According to The Guardian, the video was shot at The Imaginarium Studios, where the reboot series of Planet of the Apes and parts of Avengers: Age of Ultron and Star Wars: The Force Awakens were filmed. Hannah Clark, the producer of the video commented, "As creatures go, chimps are one of the more difficult to animate. Not only are they quite human in their movement, but they are covered in hair. Add to this that we had no backgrounds shot, and we were asking an awful lot of any post-collaborator." The band's faces were covered in a special, reflective and light-catching make-up that allowed the computers to appropriately interpret the video feed and create renders of the chimpanzees' characters. The band members weren't playing real instruments, but similarly-shaped objects that enabled creation of realistic body positions. The animation, visual effects and motion design of the video was carried out by Mathematic – a Paris-based production company. Mat Whitecross filmed the band using a special camera. Each of band members also wore a head-mounted camera system that was configured into a three camera solution. The camera systems provided multiple video streams from which the production team was able to recreate 3D points. The CGI animated video features a group of music-loving chimpanzees that come across a Beats Pill speaker under a pile of leaves. The primates then discover the power of music and form a band that resembles the band members. The video begins with a similar layout with Coldplay's 2011 music video, "Paradise". As it opens, four chimpanzees (played by the band members) are sitting in a forest. 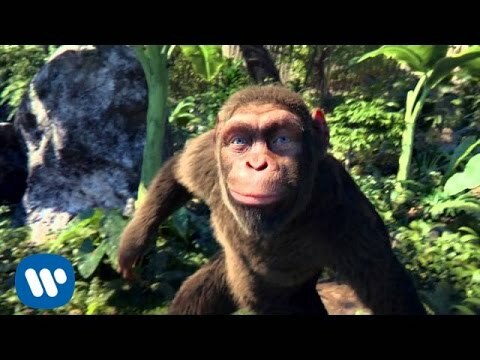 The opening verses begin after a chimpanzee (played by Jonny Buckland) find a portable speaker under a pile of leaves while it's playing the song. Another chimpanzee (played by Chris Martin) listens to the music and calls the rest of the group (played by Guy Berryman and Will Champion) to gather. It then slaps its chest and jumps to a path inside the forest alone. The character sings the song and swings on the willow tree vines. Then, the four chimpanzees dance together during the chorus. After the chorus, they find an electric guitar, a bass and a drum set. The chimpanzees bang on the instruments before they realize their proper use. The characters play the instruments and form an "ape band". A hat is added on Buckland's character and an earring is added on Berryman's character after they have formed a band. During the bridge of the song, the band is surrounded by other chimpanzees (also played by themselves). The rest of the video features the dance movements of the other chimpanzees and the performance of the ape band. At the end of the video, Martin's character climbs up to a tree and overlooks the view of the forest which also features some Indian temples, a reference to the Indian inspiration of the associated album, A Head Full of Dreams.